Here's an awesome list of the Top 10 TV bars to get drunk at. Many of them are from my fave shows of the '70s and '80s. I heartily agree with at least some of these. 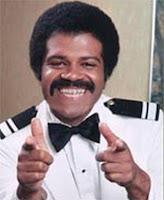 I always wanted to have Isaac on "The Love Boat" make me a fruity drink and then do that snazzy pointing gesture he does in the opening credits. And what kid in the '70s didn't think they were going to grow up and have their own slightly sleazy but oh-so-adult Regal Beagle just down the street? The one they left out isn't really a bar, it's more a restaurant, but I always envied Quincy, M.E. hanging out at Danny's.